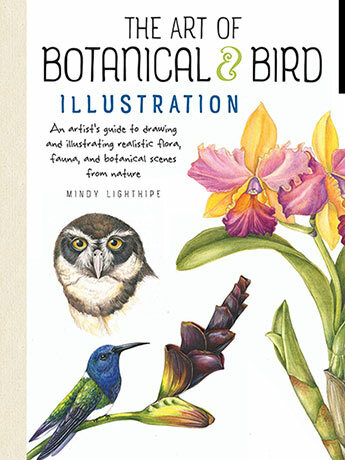 Draw and paint beautiful, vibrant, and realistic birds and botanicals. This one-stop guide will teach you to take a simple sketch and transform it into fine art. The Art of Botanical & Bird Illustration is a guide for contemporary artists aspiring to master shape, colour, and texture and render beautiful, realistic, and vibrant botanical artwork! An expert botanical artist educates you about the tools and materials traditionally used in botanical illustration, including pencils, coloured pencils, watercolour, gouache, and pastels. This thorough yet easily digestible guide includes overviews of key illustration techniques and basic colour theory and mixing and is loaded with exercises designed to help you learn to see shape, value, and form. By learning to understand plant life and anatomy, you can craft elegant flowers, leaves, trees, and much more in no time! To bring it all together, The Art of Botanical & Bird Illustration includes step-by-step demonstrations to follow along with as you practice taking sketches and transforming them into fully rendered, colourful pieces of fine art. Artist Mindy Lighthipe is passionate about getting out into the natural world and discovering the beauty in every rock, stream, and forest. Using a variety of techniques to create her bold imagery, Mindy paints in watercolour, gouache, coloured pencil, and pastel. She is certified in botanical illustration by the New York Botanical Garden and has taught classes in botanical art and natural science illustration.